Limit 1 per person. Valid on a 1-hour women's yoga party. Valid Monday-Thursday between 4 p.m. and midnight. Valid for up to 6 women; additional guests can be added at $35 per guest. More than 12 guests will require an additional instructor. Includes use of mats and accessories. By appointment only. Promotional value expires 60 days after purchase. 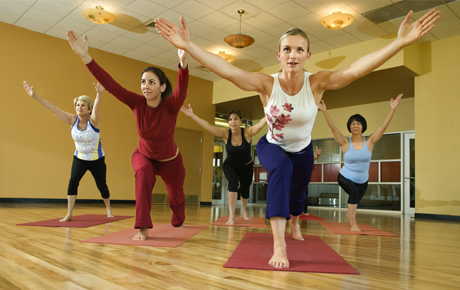 Host a party to remember with this deal for 50% off a women's yoga party from Women's Yoga Party, available within 15 miles of Mount Prospect ($360 value). Select a weekday evening to have a yoga instructor come to your home to provide you and five girlfriends with a fun and energizing 1-hour yoga class. Women's Yoga Party is a unique way to bring health and relaxation into your life. The friendly and highly trained instructors will ensure your class is fun and relaxing. If you've never tried yoga, these at-home classes are a great way to try it out in a casual and comfortable environment. If you and your friends are more advanced, the instructor will adjust the lesson to fit everyone's skill level. Switch up the usual girls' night with this entertaining deal.